This is a free play that CrossRoads does for the public. 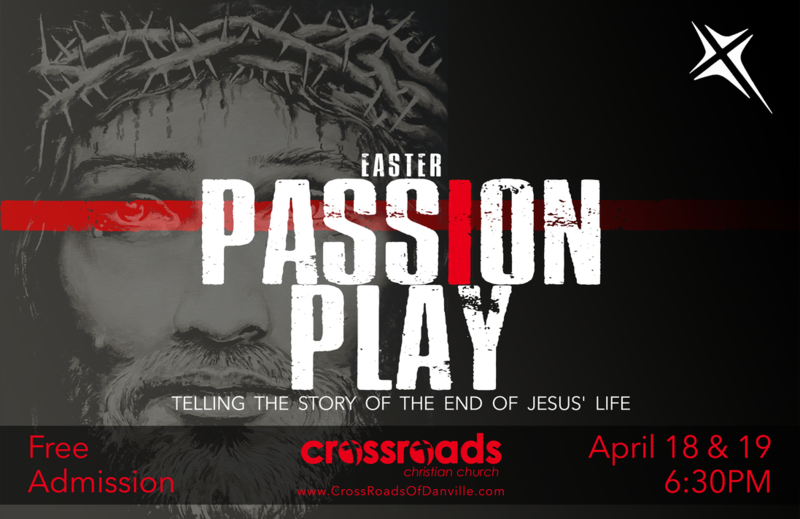 We want as many people as possible to experience the Easter story and be reminded of the love Jesus has for the world! We just launched our custom Mobile App! ​On the App you can find previous Messages, receive Push Notifications about specific areas at CrossRoads, take sermon notes and save them to your phone, fill out your connection card, and a whole lot more. Check it out on your mobile device today! As a church, we know there are always going to be things we need to do better! That's one reason why we want the church to fill out connection cards when they're with us for worship. We want to know who's hear so that we can do a better job following up with the people who have been gone for a bit. That's also why we are asking our guests to give us their feedback, basically your "First Impression" of CrossRoads. We want genuine and honest feedback in order to better be the church that God has called us to be. If you take the time to do either the Connection Card or the Guest Feedback survey, I want you to know that we truly appreciate it and hope that you see the improvements we make because of your willingness to be a voice for us to hear. We're in preparation for Easter Service and praying for the Holy Spirit to be preparing us and convicting us through Worship. We're going to have a Special from our KidZone Kids, a great group from our CrossRoads Worship Team leading our Song Service, and a challenging Message from God's Word. Invite your family and friends. It's going to be a great opportunity to hear the Gospel Message. ​and God's people through community. ​Gather with us this weekend during 1st or 2nd Session to worship God Almighty. RightNow Media serves over 16,000 churches everyday. And CrossRoads has the opportunity for every person who walks in our door to have free access to their content. At CrossRoads, we desire a culture of connection because we know discipleship happens in small-group settings throughout the community, not in corporate worship Sunday after Sunday. Want to get better connected with CrossRoads? It's time to find a group.